Seven years ago, with the global economy about to be sideswiped by the Great Recession, I launched Michigan-based The Big Salad, a health-conscious chain of eateries appealing to budget-conscious consumers. The Big Salad isn’t an ordinary open salad bar with patrons dipping hither and yon for their desired mix. Rather, salad chefs, who undergo at least 15 days of training, are positioned behind glass partitions ready to assemble meals to customer specifications. We estimate there are millions of salad permutations atop our iceberg, romaine and spinach bases, given more than 40 toppings and 30 dressings are available at each store. And in addition to offering each salad in a wrap, Big Salad also sells sandwiches and a wide variety of soups. Mindful of the out-of-reach costs for organically certified food for the masses, I sought the smart middle ground of those determined to eat healthy yet affordably in a casual family setting. For those wanting only organic—and willing to pay a bit more for it—The Big Salad gradually is making such items available. Healthy eating doesn’t necessarily come with a low-profit margin. For starters, The Big Salad sources only U.S.-grown products that adhere to U.S. Food and Drug Administration standards. Moreover, protein items are hormone and antibiotic free. We avoid mass-produced products and maintain as all-natural as possible, with no chemicals and preservatives in the produce we source. A prime example is our business relationship with Cambro Inc., which provides color-coded, air-tight storage and shipping bins from the pickup point of growers and food providers to the chain’s in-store stocking areas. The color coding signals freshness levels to Big Salad employees, instructed to use only the latest and freshest of goods in their kitchens. The storage bins themselves are air-tight. The Big Salad-Cambro arrangement ensures the shelf-life of all fresh produce and maintains a just-in-time inventory system for all first-cut, first-picked ingredients. The Big Salad system also reduces waste to a two-percent level, well below the eight-percent industry average. And even that lower level is put to good use by being shipped to nearby schools’ compost bins. I am pleased that our emphasis on healthy and fresh has attracted prime endorsements in our brief existence. Most recently, we were contracted to set up an outlet in the University of Michigan Hospital Café in Ann Arbor. Earlier, we established a shop at the Hayes Green Beach Memorial Hospital in Charlotte, MI, just west of the state capital in Lansing. Healthy eating doesn’t necessarily come with a low-profit margin. It’s a fine balance to maintaining a healthy bottom line. We think we’ve found that balance at The Big Salad. Another healthy introduction was the launch of a new and improved mobile app-based customer loyalty program aimed at helping our 12,000 current, as well as future members. The new program was designed using customer feedback. We’re working to continue to seek out technologies to improve the overall customer experience and improve our own business processes. 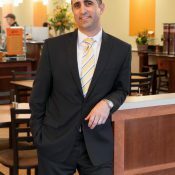 In 2007, John Bornoty created The Big Salad, LLC, a restaurant specializing in custom salads, soups and sandwiches. To date, there are seven outlets in Michigan and Bornoty plans at least another 100 restaurants across the country over the next decade.